This whimsical Christmas tree trio with colorful and festive lights pops against a black background on this 10" square plate. Design of brilliant colors are fired at 1600 degrees F. between two layers of clear glass. Each piece has its own unique character of surface texture and bubbles. 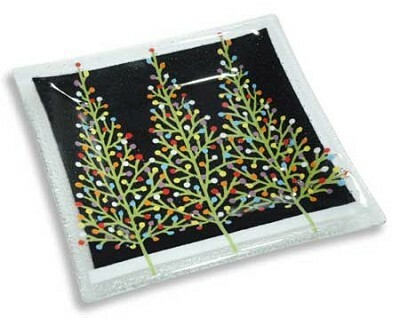 Peggy Karr Glass is food-safe, microwave warming and dishwasher-safe, a truly functional piece of art. Each item is individually boxed.